Searching for popular Kanye West quotes and sayings. If yes, now you don't need to search for them anymore. As here I have compiled down some of the famous Kanye West quotes from his songs, and interview quotes. 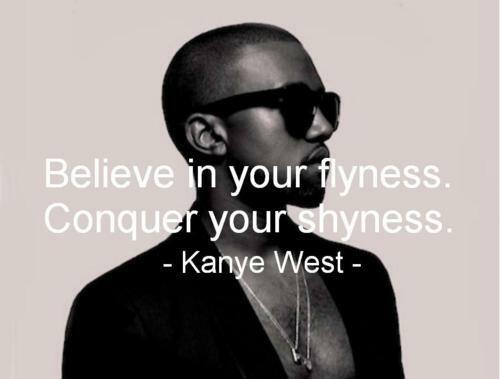 Just hope, you will like this quote compilation and able to share some of these Kanye West quotes. Having money isn't everything, not having it is. To use is necessary. And if you can't be used, then you're useless. Take your diamonds and throw em up like you're bulimic. Yeah, the beat cold, but the flow is anemic. ..my music isn't just music- its medicine. For me giving up is way harder than trying. I am not a fan of books. I would never want a book's autograph. If you admire somebody, you should go ahead and tell them. People never get the flowers while they can still smell them. Sometimes when I see a bad performance and people still clap... I wonder if they're clapping because they liked what they saw or because they're happy it's over? I believe in myself like a five-year-old believes in himself. They say look at me, look at me! Then they do a flip in the backyard. It won't even be that amazing, but everyone will be clapping for them.